“Reality Christmas.” That’s the genre that Over the Rhine are making their own: A catalog of Christmas music that shuts down sentimentality, embraces honesty and authenticity, and insists on reaching through the darkness, the hardship, the heavy-heartedness, toward hope. 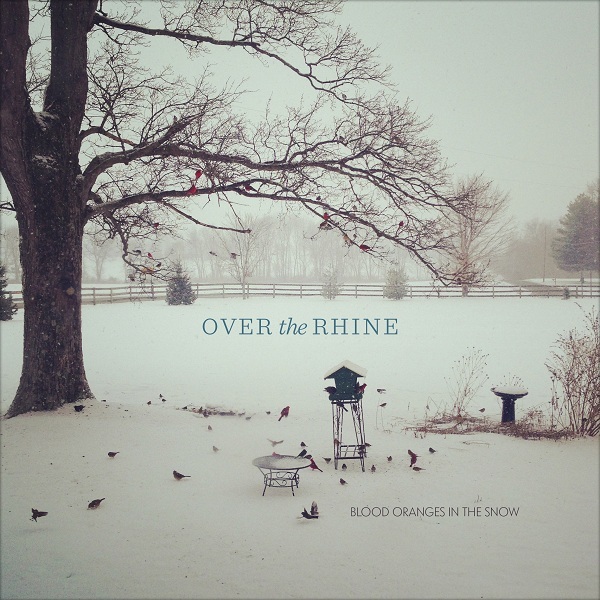 In this, my fourth Looking Closer conversation with Linford Detweiler of Over the Rhine, we talked about the stories behind the songs on the band’s third “Reality Christmas” album, Blood Oranges in the Snow. Want to listen to the album while your read the interview? You can, thanks to The New York Times. I have to know: Where did the title come from? Have you ever eaten blood oranges in the snow? Yes. My parents, having both survived the Great Depression as small children, both grew up during a time when receiving an orange as a child for Christmas was significant and very special. We always had oranges (including blood oranges) on the table at home for Christmas. The smell of oranges was as important as the smell of pine boughs. Regarding the title, I can’t remember when it popped into my head, but the writer part of my brain immediately began vibrating and I knew there was a song there. The harmonies in this opening track are dreamy. Now that you’re singing more harmonies, I wonder: Are there couples or duos you’re listening to more intently? The Milk Carton Kids did a few tours opening for us, and sat in on a Hank Williams song that we would all sing in the room together away from the microphones. I must admit, hearing Joey and Kenneth sing together made me want to sing more with Karin. Beyond that, Karin has been gently encouraging me to sing with her for years. We both grew up in churches where there were always people gathering around singing harmonies. Somewhere along the line though I acquired a bit of a hang up regarding my singing voice. Singing more with Karin these last few years has been a gift for me. Singing is tremendously empowering. There are several songs mentioned in this title track: “Red Wing,” for one, and another that you’ve often mentioned in onstage banter: “Let the Lower Lights Be Burning.” Can you say a bit about the significance of those? “Let The Lower Lights Be Burning” has always been an important song to me because of the evocative name, and because it was based on a shipwreck in Cleveland, Ohio, that was quite tragic. The man who was supposed to turn on the harbor lights in the fog was drinking and fell asleep, and a passenger ship ran aground. “Be Still My Soul” is an important song to my family because those words are on my father’s gravestone. I think we love Christmas carols for a lot of reasons, but one of the most important is that they become these little time capsules of memory that we get to open up each year. They bring back what we were experiencing in past years when we heard them. It just so happens that my most vivid — and my favorite — Christmas memory is of coming home after the crowded, noisy hubbub at my grandparents’ place. I collapsed on the living room couch, and my parents and my brother went to bed. I stayed there, watching the blinking lights of the Christmas tree cast wild, needled shadows across the ceiling, and they would change, creating mysterious pictures across that white canvas. And I knew as I lay there that this would always be my favorite Christmas memory: Occasional gusts of wind blowing sleet against the window, a pile of unopened presents under the tree, and all of these beautiful, terrifying, abstract figures fading in and out on the ceiling. So this song super-connects a powerful childhood memory with my more complicated holidays in a way that blesses me. I get the feeling that there are distinct personal memories here in your lyrics. What are some of the most vivid images of your childhood Christmases — those that are most important to you? 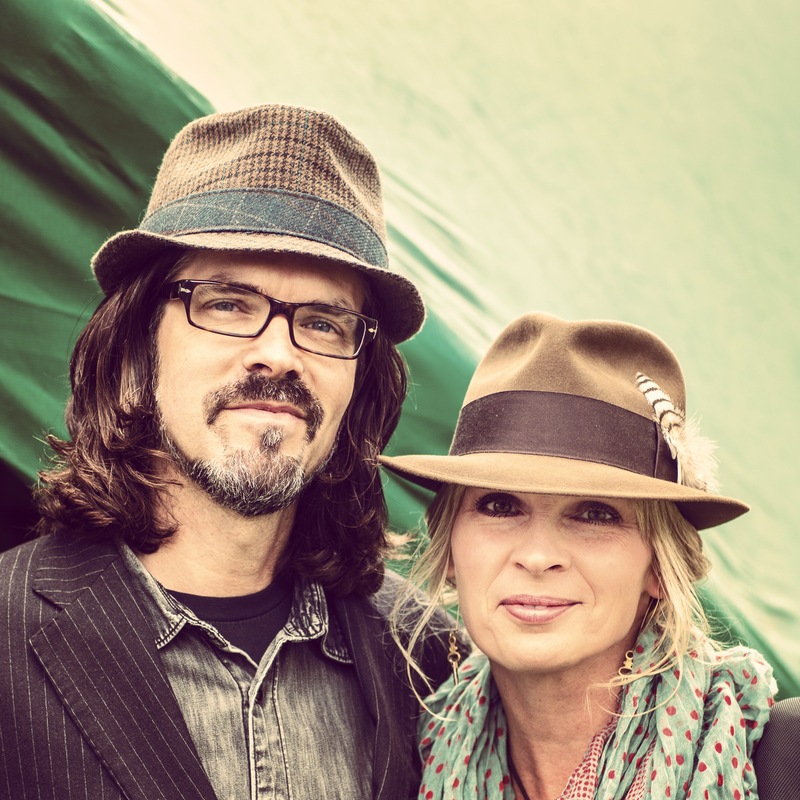 Linford Detweiler and Karin Bergquist have big, barn-sized plans for Over the Rhine’s future. The song “Blood Oranges In The Snow” contains memories of an era of my childhood that I haven’t written about much. My parents moved to Montana for about 6 years when I was eleven, and though they didn’t have much money, they sent all of us kids to a boarding school in Canada in Alberta, where they thought we could get a good Christian education. (Actually, that school gave me my most important piano teacher.) But anyway, getting home at Christmastime, crossing the border and negotiating snowy mountain passes was always an adventure that would have made Laura Ingalls Wilder lose sleep at night. But we knew the glowing lights of home were waiting for us. That’s always been part of Christmas for me: the melancholy of trying to overcome the odds to find a place called home. One of my favorite memories that I mention in the song is the fact that my mother would often give me a pass on washing dishes if I would play hymns for her out of an old hymnbook – try to find an old song that she didn’t know. I never did find a hymn she didn’t know. Also, one of my favorite (and most humorous to me now) Christmas memories is coming home to Montana broke from boarding school and being determined to shoot a coyote. Back in the day a coyote was worth about $125, and I had decided this was our ticket to financial stability. My brothers and I spent our two precious weeks of vacation getting up early, traipsing up and down mountains, trodding river bottoms and fanning out across foothills armed to the teeth. We saw mule deer, porcupines, jack rabbits, elk, who knows what all. We never so much as grazed a coyote. Your Christmas songs often express the struggle to hold on to belief in the midst of trouble. Does the process of writing and singing songs like “Another Christmas” strengthen those muscles of belief in something that the rational mind struggles to hold? Or does it feel more like a lament, more like a way of voicing what you wish for? That’s a great question. All I can say is that those of us who grew up with the Christmas story were taught that something incredibly redemptive happened. Angels were singing, Good news! Peace was coming to earth. Good will and mercy, abounding. The cycle of violence that we humans are so addicted to was going to be broken once and for all by this little child. The distance between that ancient dream of peace on earth, and the reality of where we are today, can feel like a wound too deep to heal. I think a lot of our Christmas songs live in that gap, that distance, that tension. But yeah, peace coming to earth, wrongs being put right, forgiveness replacing violence, who doesn’t want to believe in that possibility? I still do. I’m reluctant to ask about the third track, “My Father’s Body”: It tells such a perfect story. And it would land on a short list of my favorite Over the Rhine songs. How did it come about? Linford sings lead on two of the first three tracks on Blood Oranges. After my father’s funeral, my sister-in-law Kathy said, “I envy you. You have your songwriting. You get to go process your grief and do something constructive with it.” I thought, Well that’s a lovely word of affirmation. I’ll try to receive that. But the years passed, and I wasn’t writing anything. Then a year ago, that title popped into my head, and it has a sort of Robert Frost rhythm about it. I grabbed a manila envelope that had arrived in the mail and scribbled those verses down as quickly as I could before they vanished. And I think I found some healing in the song. Did it occur to you that this would be the first time you sang lead twice? Is this a special occasion, or will future Over the Rhine albums likely see this shift continue? When Karin heard my demo of “Another Christmas” she, as a producer on this project, made the call that I should sing lead on that one. “My Father’s Body” is more of a straight duet, really. I’m hoping we do much more singing together moving forward. 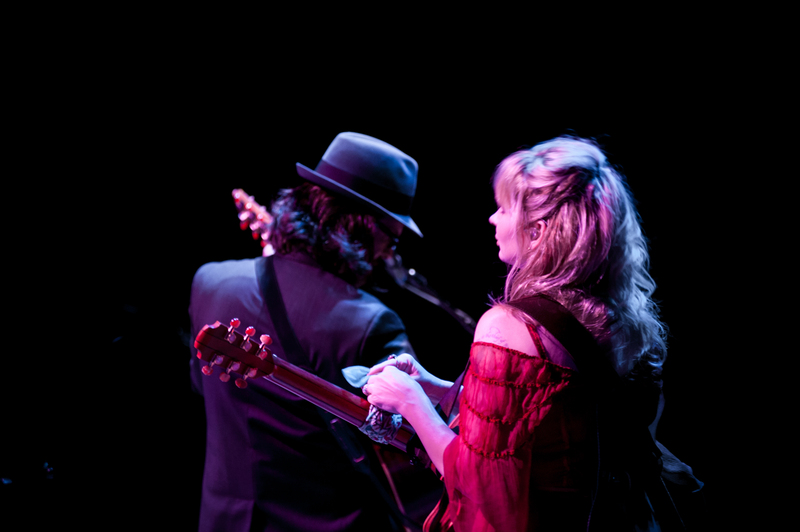 I believe it was The New York Times that recently referred to us as “close harmony singing duo Over the Rhine” so we’ll receive that. It’s great fun to sing together. I was surprised by the inclusion of the Merle Haggard cover, “If We Make It Through December.” Joe Henry included that on his list of favorite Christmas songs, which I published at Looking Closer last week. Did he recommend it for you, or who picked it out? “Let It Fall” has been a highlight of your live shows for a few years now, and I’ve been looking forward to finding it on an album. It reminds me of REM’s “Everybody Hurts” or Peter Gabriel’s “Don’t Give Up” … two of the great “consolation anthems.” I’m sure it’s going to be an audience favorite, one they’ll turn to in hard times. Wow, that’s good company. I like both of those. And, speaking of past tours… it’s quite a pleasant surprise to find Jack Henderson back playing with you on this record… and an even bigger surprise to find him singing on “Bethlehem”! How did that come about? Do you know anything about what inspired him to write ? 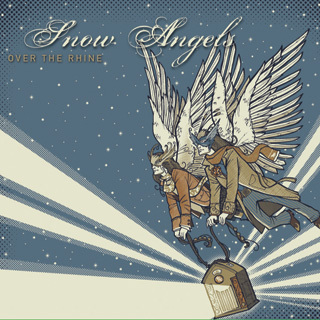 Snow Angels: Over the Rhine’s second Christmas album (2007). Jack is a great songwriter. We asked him and Kim Taylor, another friend, to write songs for this project, and both contributed beautiful songs, Kim’s being “Snowbirds.” Again, when Karin heard Jack’s demo of “Bethlehem” she, as a producer on this project, made the decision that he should sing lead (mostly) and she should sing harmony. We all see it as sort of a sister song to “Little Town,” a song I wrote for Snow Angels, our second Christmas record. There is some version of “O Little Town Of Bethlehem” on all three of our Christmas records – the only tune that has appeared in some form on all three. This album reminds me, in a way, of your anniversary concerts in Cincinnati, the way you’ve brought back so many former collaborators: Mickey Grimm, Jason Goforth, Jack Henderson, Kim Taylor, Jay Bellerose. Was it part of the plan to make this a sort of reunion record? It just felt right. We felt that all those players had something significant to contribute to a particular song. “First Snowfall” is one of the most epic Over the Rhine songs. That’s a lot of lyrics. Did this one just show up all at once? Or did you write it over a long time? It almost feels like a short story, something a little more fictional than you usually write. Am I right on that, or is this another song born of places and events you’re remembering? Several people have talked about this feeling like a short story. It’s kind of a mash-up of memories, not strictly autobiographical, of course. But having lived for ten years in the neighborhood of Over the Rhine in Cincinnati, which could get pretty dirty and dingy back in the day, trash blowing in the streets, it always felt like the first snowfall of the year was a fresh start of some kind. After dark during a snowfall, when each streetlight would turn into its own little snow globe, and things would slow down and go quiet in the city, it always felt like something sacred was happening. Closing with a New Year’s Song make me wonder: There’s a sort of through-line from The Long Surrender, Meet Me at the Edge of the World, and this record — a sound that makes them flow seamlessly. Before that, you seemed to take sharper turns in style from record to record. Have you settled into the sound that feels like home? Or do you still get any itch to do a noisier rock record, or something strange and different? 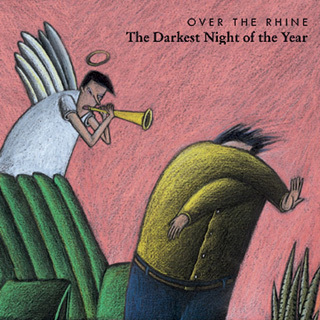 The Darkest Night of the Year: Over the Rhine’s first Christmas album (1996). We get the itch. The reason we wanted to have Jay Bellerose, and Eric Heywood, and Jen Condos play on this Christmas record was because we toured with them last fall and had a truly memorable, lovely time. We wanted to bring that chemistry to these songs. And we weren’t thinking of mixing it up from Meet Me At The Edge Of The World to Blood Oranges… That wasn’t the issue. The issue was mixing it up from Darkest Night Of The Year to Snow Angels to Blood Oranges In The Snow and in that regard, I think all three of our Christmas records occupy unique landscapes. But no, we never want to make the same record over and over. You’ve been teaching songwriting at The Glen Workshop for a lot of years now, and the plans for your upcoming “barn-raising” are steering you toward a new kind of role in a creative community. For those who have entertained the notion of coming to your workshop: What they can look forward to if they register? Well, each workshop is a little different and takes on its own life, but basically we just tell those who attend everything we know about songwriting, anything that’s been helpful to us over the last 25 years. And then we gently explore each other’s songs-in-progress, and do some writing together. It’s a very restorative, inspiring week, partly because we are exposed to the work of other artists throughout the week – poets, painters, novelists etc. The cross-pollination is priceless. Tell us about the event coming up in May 2015, and the opportunity that we have to help you build the next chapter of Over the Rhine’s story. Karin and I are tying a bow on 25 years of making music together. It has become plain to us that there is no way we can repeat those 25 years moving forward. So we have to reinvent what we do somewhat, or perish. There are different questions artists can ask (especially young artists). You can ask, What must I do to be famous? In which case, you will open yourself up to all kinds of destructive forces within and without. Another question you can ask is, What must I do to make this sustainable, to practice a craft for the long haul? Years ago, Karin and I realized that there was no way we could sustain a career if we kept giving away our music to major labels. So we decided to only license our music so that we could retain ownership, even if it meant operating on a smaller scale. Well, we’ve concluded we can’t sustain our career moving forward in the modern era of streaming etc, unless we establish our own creative home base. So (in the spirit of Levon Helm) we are restoring a 140-year-old barn into a performing arts center and recording studio. As we continue to grow older, we hope to begin traveling less, and hosting more events at home. What a dream it would be to play a great show and then sleep in our own beds. We have made three records now with the help of our fans. Building the barn will be the biggest project of our career, and we won’t be able to bring it to completion without the help of our extended musical family. We’re hosting barn raising concerts on Memorial Day Weekend 2015 to raise funds for this project. And we hope people from far and wide will make the trek to Ohio to see the farm and the barn and be part of this big step. It feels pretty special. If people are interested in obtaining tickets to this picnic/party/musical gathering, they can check out our website.